A major reason behind unemployment and thus poverty in the country is the lack of awareness among the students about the wide range of careers they can pursue after completion of their degree. Despite the fact that 800 careers and 400 disciplines after intermediate are available in Pakistan, the nation can make no use of it due to lack of information among the students. 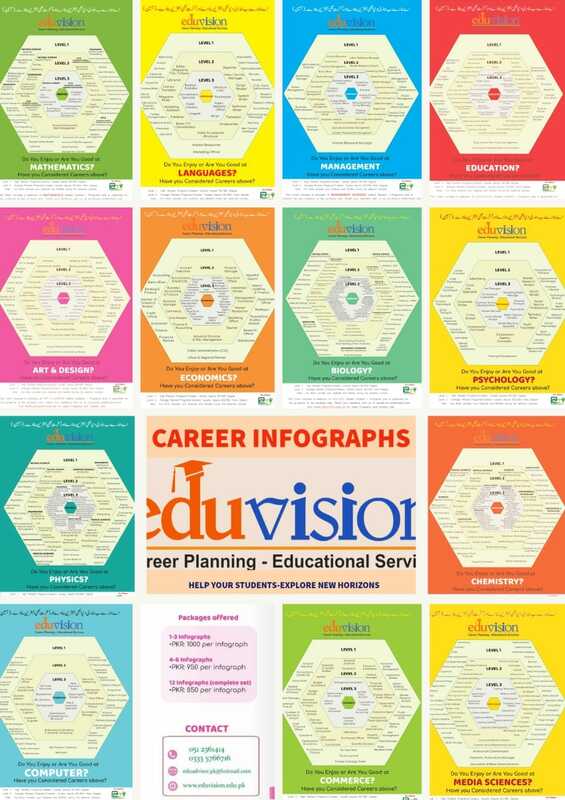 Eduvision has found an effective solution to this concern in the form of ‘Career Infographs’. A career infograph is a beautifully designed poster covering all the careers available in a field of education. These careers are divided into three categories depending upon their ranking and educational requirements. One wall at each institution will be designated as Career Wall with 13 Career Infographs posted on it and each infograph will cover one field of education. This wall will, no doubt, be an ultimate source of guidance for the students of the institution.